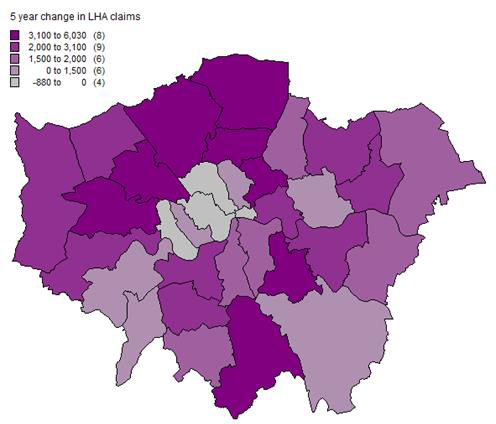 Changes in LHA claimant rate between 2009 and 2014 have led to a disproportionate increase in claims for outer boroughs (20 per cent higher than April 2011) compared to inner boroughs. Ealing, Brent, Barnet, Enfield, Haringey, Hackney, Lewisham and Croydon experienced the highest increase in claims throughout this five year period. Three inner boroughs experienced a decline in claim rate. While LHA claim rates have increased in outer London throughout this period, there has also been a notable switch from out-of-work claimants to in-work claimants over the past year. Households where at least one member is in work now account for more than half of the LHA caseload in London (56 per cent). It is notable that based on median rents (August 2015), Redbridge, Barking and Dagenham, Havering, Bexley, Bromley, Croydon, Sutton and Hillingdon are currently the cheapest boroughs, in relative terms, to find a one bed flat in London.